Your whole house will smell of apples and cinnamon when you make these baked dough ornaments. This is a guide about making cinnamon applesauce Christmas ornaments. In medium bowl, combine cinnamon, cloves, allspice, ginger, and nutmeg. Add applesauce; stir to combine. Work mixture with hands two to three minutes or until dough is smooth and ingredients are thoroughly mixed. Roll out dough into 1/4 inch thickness. Cut dough with cookie cutters. Using straw or pencil, make small hole in top of ornaments. Bake on an ungreased cookie sheet at 150 degrees F for 1 hour. Remove from the cookie sheet and bake on the oven racks for another 1 1/2 hours. 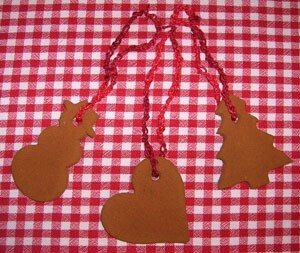 Use to decorate gifts, hang on tree, etc. Ok, it's Christmas in July, er August! Make these and store them for Christmas or use them hanging in your car. Mix together and roll on lightly floured cloth till 1/8 inch thick. Cut into desired shapes using cookie cutters or a knife. Use a knitting needle to put a small hole at the top of your ornament to place an ornament hanger later. Cook in preheated 200 degree F oven until hard, about 1 1/2 hours. These are so much fun to make and they make your house smell just heavenly! Mix ingredients to play dough consistency. Chill. Roll out and cut into desired shapes. Make a hole for hanging. Note: Drying can take 1 or more days. When making long lasting, nicely scented Christmas decorations with the kids, mix white school glue and lots of cinnamon (until you get a doughy consistency). Roll this out and use your favorite holiday cookie cutters to cut out shapes for ornaments! Make a hole in the 'cookie' with a straw, then bake in the oven at a low temp until the ornaments are dry. When rolling out your dough, use more cinnamon as the 'flour' you would otherwise use when rolling cookies for cutting. After the ornaments are dried, string colorful ribbon through the hole, hang and enjoy! I made my first set of these almost 20 years ago and I can still smell them! If you don't want to dry them in the oven, you can sit them in a sunny window, undisturbed, for a week or more to air dry. This is a very simple recipe and one that you will really enjoy! I am looking for the applesauce and cinnamon recipe to make Christmas cut-out ornaments. These are extremely easy to make and the results are so cute and Christmasy! Mix equal parts of applesauce and cinnamon. (1 cup applesauce/1 cup cinnamon) Mix until a soft and perhaps sticky dough is formed. Roll the dough out or press with hands until it is approximately 1/4 inch thick. Using your favorite Christmas cookie cutters, cut out as many shapes as possible and place them on a wax paper lined cookie sheet. Use a straw to cut out holes in the ornaments. Let your ornaments set in a dry place for 2-3 days until they are dry and hard. Caution: They will still be fragile, so you should be gentle with them. Cut ribbon to the lengths you want and tie through the holes in the ornaments. Your ornaments can be used for your tree or tied to the top of Christmas gifts. The scent should last up to 3 years! Here are some of the ornaments I made. I used 2 cups cinnamon and 2 cups applesauce and I ended up with about 33 ornaments. I also added some pumpkin pie spice and nutmeg to enhance the scent. Instead of ribbons I used crochet thread and chain stitched my "ribbons." Here's another: 15 Tbsp. plus cinnamon; 12 Tbsp. applesauce. Blend cinnamon and applesauce together in bowl, mix well. Dough should be stiff, add more applesauce if dough does not stick together. Preheat oven to 150 degrees, cover work surface with wax paper; sprinkle wax paper and rolling pin with cinnamon. Roll out dough to 1/4 inch thickness. Cut shapes with cookie cutters. Place cut-out shapes on cake rack, Bake till dry. How do you make ornaments out of applesauce?